For more than a decade, America’s Charities has reported trends, attitudes, and perceptions in employee workplace giving through our Snapshot Report Series. We've explored these trends from the perspective of employers and nonprofits. With Snapshot 2017, we are offering a first-ever look at trends in employee giving from the perspective of donors. Between January and April 2017, more than 1,500 employee donors all across the country took the Snapshot 2017 survey to share what they value, how they make decisions about charitable giving and volunteering, and how their giving impacts their relationships with their employers. 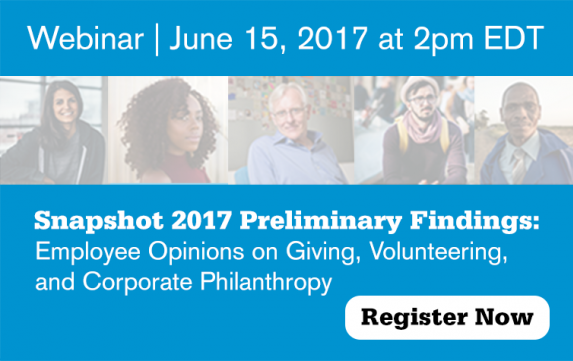 On June 15, 2017 at 2pm EDT, America’s Charities will dive deeper into preliminary findings from Snapshot 2017 and provide insights into what those findings mean for workplace giving and employee engagement leaders. Click here to register for the webinar. Complete findings from Snapshot 2017 will be published this fall when we share the Snapshot 2017 report. Click here to pre-register for your complimentary copy.